iHeartPrettyPolish: Rainbow Favorites Week Challenge - Green! Rainbow Favorites Week Challenge - Green! I was looking forward to "Green" day on this challenge. 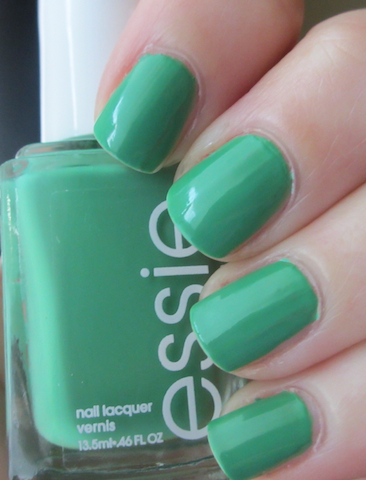 I LOVE green nail polish and although I have many that I call favorites, Essie Mojito Madness is my #1. Why can't all Essie shades be this easy to apply? It was perfectly opaque in 2 coats and it wasn't streaky at all. I highly recommend Mojito Madness if you are looking for a Starbucks green. It's just so unique and pretty. Check out the rest of the bloggers and their greens! Loving!! Green is probably my favourite colour for nails (together with purple) and I had a tough time choosing only one for the challenge! Me too! I love purple too:) Great minds think alike. i haven't posted my green yet but ill get it done later. Great swatch, this colour look really good on you! I just wore this for the first time on Friday,I can see why you've picked it as a favourite, as I love it too! I'm not a green lover in the sense that its my favourite shade to wear (I love purple way to much) but Essie makes 2 of my all time fav polishes which just happen to be green: Pretty Edgy and Mojito Madness. Mojito Madness is definitely my favorite green along with a England Dragon. I've already swatched both of those though, so I'm going to go with my #3 choice, lol! Great color on you! I know, I just swatched it not too long ago, but this gave me an excuse to do it again! I love this one too! I had a hard time choosing and ended up picking something else. It looks lovely on you! This looks gorgeous on you! You have such an affinity for picking colors that go well with your skintone. Just lovely. Ooooh, I need to try it on my toes...good idea. Gorgeous! I love Mojito Madness so much. I agree. Fear or Desire looks beautiful! Every time I see this, I think i NEED it, but am trying to be good and on a no buy! Plus, the fall collections are coming and they break the bank every year for me!